These beautiful flower shaped earrings are a stunning work of art. Silver jewelry blended with enamel jewelry, this fascinating pair of silver earrings catches the eye, and is sure to please the one you love. Made by Idit Jewelry, this piece of Israeli jewelry is one that will be talked about for a long time. If you’re looking for topnotch jewelry and want that perfect blend of silver and color, you’ve come to the right place. Idit Jewelry has created this stunning piece of silver enamel jewelry meant just for you and your loved one. Israel is known for its array of beautiful flower, and this Israeli jewelry piece portrays the artist’s appreciation of the grown wildlife found anywhere in the country. Shaped to resemble a flower, these silver jewelry earrings are painted with green blue enamel paint, giving color and life to them. 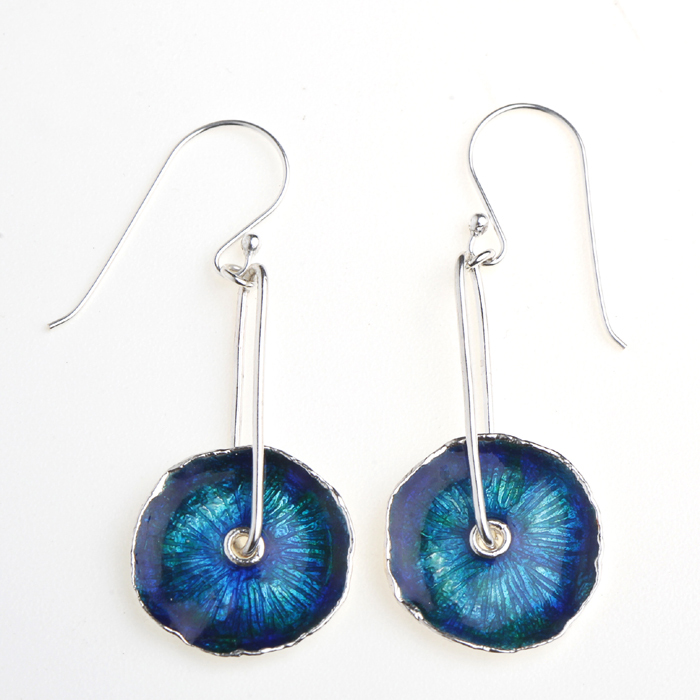 The color gets shinier towards the center of the flower, making the earrings sparkle and shine in the sunlight. It would almost look as if the flowers were dancing whenever the wearer moved. Although the bluish hue is more prominently seen, you can certainly find the subtle green stripes in the center, mixing with the blue to form a beautiful turquoise. The flower measures 1.8cm (7/10") in diameter, large enough to be seen from afar, yet small enough to not weigh down the earlobe. From the hole in the center of the pendant, a long oval loop made of silver connects the flower to the earring itself, giving the whole an elegant and graceful touch. Measuring 3.5cm (1"4/10") in length, the silver enamel jewelry is the perfect dangling length. No matter the occasion, be it graduation, anniversary, birthday or just to say “I love you”, these gorgeous earrings are sure to be appreciated by the grateful recipient, and are a welcome addition to any jewelry box or collection.